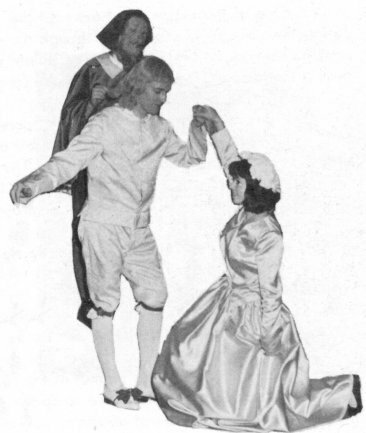 In the light of the previous term's production, The Royal Hunt of the Sun, Twelfth Night proved to be a remarkable success. It was obvious to everybody concerned that the Christmas Production could not be even remotely as spectacular as its immediate predecessor, and so it became necessary to embark on an entirely new field of drama. Looking back, the choice seems almost too perfect to be true. Shakespeare and good comedy are perhaps two of the most difficult achievements in even the professional theatre, and combined they present an almost impossible task to a school theatre group - or at least to most of them. In the programme, Mr. Pickles, somewhat apprehensively, suggested that the Twelfth Night is perhaps the most beautiful English Comedy. I am not qualified to comment on the beauty, although a number of Sixth Form English Students have assured me of the truth of this statement. However, the laughter emerging from the school hall on four consecutive nights last December must surely stand as an unbeatable record. Much of the credit must, of course, go to Shakespeare himself; after all, it was his play: but an at least equal share is due to the cast, who appeared to revel in their appointed roles. Albert Welling, as Malvolio, demonstrated again the talents which have gained him such respect as a member of the National Youth Theatre. Until now, he has been limited mainly to serious roles, but, as the deceived Malvolio, he demonstrated his unlimited range of acting ability. Peter Herbert, portraying the apparently obvious character of Sir Andrew Aguecheek, did so in such a way that it had to be seen to be believed. 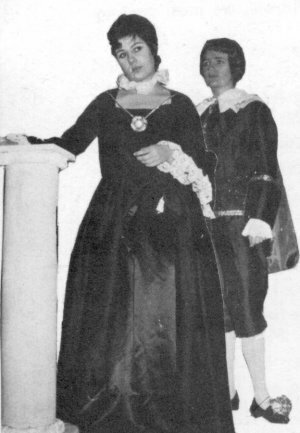 Michael Jennings was completely at home as Sir Toby Belch, a part which frequently allowed him to make use of the voice usually reserved for reprimands during assembly. The most difficult task, however, may well have gone to Colin Clubbe, on whose shoulders - or vocal chords, was bestowed the unenviable trial of singing solo to an audience riddled with familiar faces. For only the second time in its history, the school found it necessary to use girls, for the vital roles of Viola (Judy Emmett), Maria (Tricia Nicholls), and Olivia (Corrine Devery). Many thanks and congratulations are due to these and the entire cast, not forgetting the Director (Mr. Pickles), Stage Director (Mr. Tufnell), Stage Manager (G. Carroll), Stage Crew, and all those who were involved behind the scenes, and who helped to make Twelfth Night the resounding success that it undoubtedly was.